"I worked for Senator Fumo for 8 1/2 years and I was prosecuted in this case. I didn't steal a dime and it was my first offense but I went to prison for 23 months, put under house arrest for 3 months then put on probation for 3 years. So when I tell you I didn't think there was a thing I didn't know about this case you would think that I knew what I was talking about." "Well I was dead wrong! As I read this book I was shocked to find out the things that the government did in this case, the unfairness and the get Fumo at all costs mentality of the government made me sad to be an American. When I read that the judge in our grand jury was a man Senator Fumo blocked from being a judge for 10 years I finally understood the steps the government were prepared to go to get Senator Fumo. 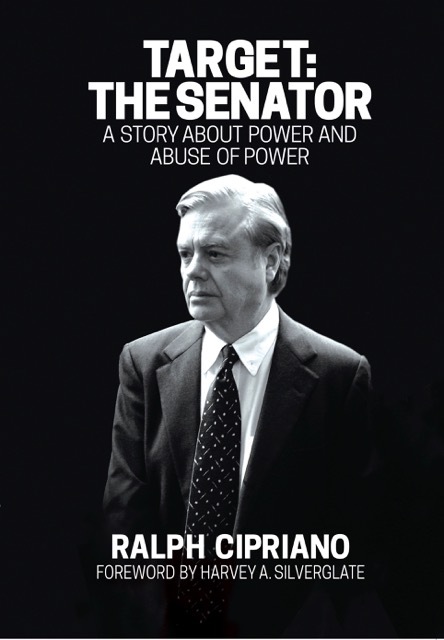 Ralph Cipriano has told a story in his book that needed to be told. Everyone I know that read the book loved it!" Luchko gave the book five stars! Initially, Amazon was grateful for his efforts. "Thanks Leonard P. Luchko," Amazon wrote back. "Your latest customer review is live on Amazon. we and millions of shoppers on Amazon appreciate the time you took to share your experience with this item." Then, the very next day, Amazon took down the review. Now he may not be the world's foremost literary critic but Leonard P. Luchko is a true insider when it comes to the USA Vs. Fumo et al. As one of the "et al"s, Luchko went to jail after pleading guilty to charges of conspiracy and obstruction of justice. In the book, I recount how Luchko repeatedly offered to cooperate with the feds who were investigating Fumo. But a team of six FBI agents raided his house at 6:39 a.m. on Oct. 20, 2005 and forced Luchko to sit through a humiliating interrogation in his underwear in front of his 79 year-old mother who was sick with the flu. Later, when Luchko was in prison, the feds wouldn't let him out to visit his mother who was on her deathbed. And when she died, they wouldn't let Luchko go to her funeral. Now how's that for compassion? If you know anything about the Fumo case, and the way civil liberties and the rules of common decency were trampled on, it was par for the course. In pursuit of defending Luchko's right to freedom of speech, I had an online chat Sunday with Ashika of Amazon.com. "Hello my name is Ashkia," she wrote under a perky cartoon picture of herself. "I'm here to help you today." I responded that I was the author of the book, that Luchko was a participant in the case, and that a book review he had written had at been first published and then taken down by Amazon.com. Ashika responded cheerfully that there was "No need to worry, I'll surely check this and help you." She had no answers, but subsequently responded, "I've successfully submitted the form," adding, "they will investigate and get back within 12-24 hours." And then Amazon was never heard from again. So I've decided to let the cat out of the bag concerning Lenny's book review. In the meantime, I'm still waiting for my laudatory book review from The Philadelphia Inquirer, where the posse of reporters and editors who used to beat up on Fumo month by month, year after year, including former editor Bill Marimow, were too frightened to be interviewed for my book. One of those crusading journalists, however, ace investigative reporter Craig McCoy, did take the time a while back to personally register his objections with me about being quoted in the book, without his permission. In the spirit of Amazon, I'd like to thank Craig for taking the time to share his experience with the book. At least he didn't say I misquoted him. In the book, I recounted how I used to sit next to McCoy at the Fumo trial and marvel at how biased his stories always were in favor of the prosecution. You'd think he was an assistant U.S. Attorney or something. One day, I asked McCoy if he and I were covering the same trial. "He [McCoy] admitted that when it came to Fumo he was 'so far down the tunnel' that he no longer knew 'which way was up.' "
Today, I'd like to take the high road and apologize to Craig for quoting him accurately on just how biased he was. Sorry Craig. You can dish it out but obviously you can't take it. Ralph Cipriano can be reached at: ralph@bigtrial.net. Ralph, I wish you would post Luchko's Testimony when he was in front of the Grand Jury. The next time you leave us for a month, we could savor added context. He must have been a prolific hacker. Probably ranks with Snowden. Sorry Jason; all of those documents have been returned to storage. The same could be said about the Philadelphia Traffic Court case, the Inky conspired with the prosecution and a Supreme Court Justice to bring down the Judges, most with high school educations and weeks of training, none with law degrees. Most of the Judges heard over 100,000 cases per year. After a very flawed five year, multi-million dollar investigation, the feds produced, by my estimate a total of 29 or 30 tickets for seven defendants. At trial, the defense team dismantled the prosecutions case ticket by ticket. The singular point the prosecution was trying to make was that "the fix was in" people just made phone calls and tickets were dismissed, which we learned was not the case. Ticketholders did appear in court to defend their tickets, one reoccurring theme we heard was ticketholders did not mind paying the fine, they were fearful of the points that would raise their car insurance rates. The defense employed statisticians to testify, mathematically it was proven that if you came to court to stand up for your ticket, you usually got a break. We never saw the rich and famous or the politically connected in the courtroom, which the prosecution alleged, what we did see were recent immigrants that did not speak English who had no idea why they were in federal court for a moving violation. Average people, little people who could little afford a rate increase appeared on the stand. The" little guy got screwed" is what the prosecution repeated over and over, but that was not the case, they got a break. One Judge was indicted on two tickets, another indicted on seven tickets, two he had nothing to do with whatsoever, two he found the ticket holder guilty and the final three he was justified in dismissing the tickets, as is still the law in the state to this day. Had the prosecution and FBI agent on the case not lied to the grand jury to get indictments, there would not have been a case. During the trial, the FBI agent on the case was brought back on the stand repeatedly to explain what he said to a grand jury, it was apparent he lied and was coached to lie, as well as the prosecution who were part of a well-planned scheme to invent a crime. Why would journalists want to align themselves with a prosecution who lied to a grand jury and again at trial? I wrongly assumed that being fair and opened minded were prerequisites for a journalist, possibly also a burning desire to set the record straight, what I learned is one only needs the ability to print word for word what the prosecution is dictating. The majority of the trial the defense won the day, the Inky printed the prosecution's version of facts for the public to read. Traffic Court was an imperfect facet of the Justice Department, but not one of the defendants deserved to be indicted by a federal jury. The Chadwick Report which was supposed to be a confidential report of the day to day activity of the court made front-page news weeks later. The Judges were told if they did not talk to Chadwick they would be fired, it was promised the information was for the Supreme Courts eyes only. This was part of a calculated effort on the part of the Inky and a vengeful Justice to taint the jury. So a powerful Supreme Court Justice who hated Traffic Court and vowed to get rid of it, federal prosecutors with all the power in the world along with an FBI agent were able to jail high school grads who did not take a dime. Is this the type of America that the Inky is signed up to defend because the America I want is one that would have gone through the proper channels, which would have been the Ethics Board in Harrisburg set up to handle such issues, which are perceived to be ethical issues at best. No one should have been in federal court for the tickets that were presented during the trial. I am ashamed that over the years I condemned those the Inky condemned, now I believe the articles were slanted toward the prosecution. We have a handful of journalists who have been at the forefront of the ruination of fellow citizens, innocent citizens. Journalists who are to blame for the demise of reputations and the inability of defendants to find gainful employment as well as the spread of inaccuracies surrounding the facts of the case. If someone accused the Inky of corruption it would be met by anger, scorn, and disbelief, but not reporting facts accurately is corrupt. Slanting the news is corrupt, working for the prosecution as a journalist is a corruption of values. We need to demand that journalists get it right and not be rewarded for their errors, no one should be able to instill hatred and confusion among the public. Alternate facts are not acceptable. People believe what they read, they trust journalists, they believe they are reading the truth, accurate fact-finding truths, not what is alleged by lawyers employed by the government who stand to gain with convictions. My wish is that all the new politicians being elected in the US will question how journalists can be slanting facts toward the almighty prosection. When innocents do not have a voice or are unable to be believed, journalists have gone too far to condemn. Antiquated terms such as "political machine" and the belief that "all politicians are crooks" hurts our democracy. Prosecutors can't have the last word nor should journalists, facts need to be the one driving force, its not about winning its about the truth. We live in a "nothings matters" era, which translates into who cares, it does not matter to me,its not my problem. Well the truth matters, it matters to defendants, it matters to their families, it matters to grand juries and juries who got it wrong due to inaccurate facts and inaccurate reporting. Was traffic court what was shown on that Parking Wars show? If anybody wants to read all the details about how the Inquirer functions as press agents for prosecutors, it's all nailed down in Target: The Senator. Wish we'd had the resources at Big Trial to cover the Traffic Court case. Whenever we've gone into court in recent years with a big government corruption case we've always seen another side of the story, typically prosecutorial overreach along with the blind, uncritical support from the hometown newspaper. The Fumo case, the rogue cops case, the Chaka Fattah case, Dominic Verdi, Penn State, Billy Doe, etc. Ralph we know you understand better than anyone, its the rest of the region we need to get on board. I doubt if anyone, unless they have been in the crosshairs of a federal prosecutor, can imagine in their wildest dreams the extent the governmnet goes to ruin lives and destroy families. Regardless if there was a crime or not. Defendants are unable to defend themselves in front of a jury that has been tainted by the continual bombardment of negative, suggestive accusations handed to Inky reporters by their accusers. No defendant could ever recover from the public maiming journalist think they have a right to inflict. Having so much control over public opinion is dangerous. There is no other point of view at the Inky. Maybe is time for defense attorneys to circulate a list of "Do Not Read" journlists who get their info directly from the feds, reporters who can not be trusted to give an accurate account of facts before trial or during, much like the list the DA's office keeps of police officers who are unsuitable to testify at trial. No reporter should be able to pretend to be "fighting corruption" while stealing a defendants reputation and dignity. Its like a sentence of life without the chance of parole, its life without the chance of regaining your reputation. Looking forward to your perspective on the long awaited Johnny Doc demise and indictment. Vince must have a few choice nuggets to add to the case. Was he called in front of the Grand Jury? Could this indictment of Johnny Doc be the cornerstone of why Vince and Kenney have had a parting of the ways? Johnny Doc was a key banker for Kenney and they are joined at the hip. It would be interesting to see if Doc trades Kenney to the Feds just as Kenney did with Vince. Ralph, it is extremely disconcerting that you have been silent regarding the Dougherty Indictment having projected yourself as a truth teller amongst your other attributes and your history of going after the criminal misuse of power. If this case doesn't clearly illustrate that graft and corruption continues to run rampant at the highest level of our Government which reflects parties such as Comcast DOJ State Supreme Court Mayor and the Local Business Agent of IBEW who managed a criminally corrupt Union who acted like an organized crime boss and had the balls to follow the Scarfo Fumo Template in the misuse of power and the theft of Union Funds and misrepresentation of its members in an all out effort to subvert the Rule of Law. I would recommend to others to read the condemnation by Larry Platt on his website The Citizen to better advance the discussion of what has happened when rotten scoundrels have the power to make life and death decisions and are allowed to operate. Dougherty should not be allowed to use Union money to defend himself and a fair jury and an honest Judge, if there is one, should render a maximum sentence. To grant him bail is an outrage and he should sit in a cell like El Chapo until tried convicted and sentenced. As the famous Seinfeld Character has said,"...no soup for you." Jason, let me explain to you a cardinal rule of life from Ralph's perspective. Just because you're excited doesn't mean I'm excited. Glad you and Larry are all in a lather about the Dougherty indictment, and see it as the end of civilization as we know it here in Philadelphia, which wouldn't be a bad thing. And I'm glad to see you've already got Johnny Doc convicted and you want to deny him even more basic civil liberties before he even goes to trial. Nice. There's a spot for you in the U.S. Attorney's office, or maybe a job at the Inky, which functions as the PR wing of the U.S. Attorney's office because you've got the right mindset. Hope when Larry wrote his treatise he had his pants on, which would be a big improvement over the way he used to conduct business as the editor of Philly mag. I have a simple question for you. Did you read my Fumo book? Did you see that the basic premise of the book was that the government and the media teamed up to destroy a citizen? How did they do it? By basically controlling the narrative, and criminalizing previously legal behavior and further encroaching on what's left of our civil liberties? If not, I recommend you read it, you might learn something. As far as Philadelphia goes, you and Larry are so shocked that the citizens aren't rallying in the streets, and burning down City Hall after they read the Dougherty indictment. News flash: most of them didn't read it, like they never read the Fumo indictment. From my perspective, we have a lot bigger problems here in Philadelphia than Johnny Doc. We live in a town without democracy, a town where only one political party has had a monopoly for the last 67 years, a town where the local Republican party functions as a prostitute on welfare, and does its part to throw elections by pulling stunts like running a bag lady for mayor. We live in a town where the local newspaper of record serves as the house organ for that ruling political party, much like Pravda functioned in Moscow. Much bigger problems than Johnny Doc. Thanks Ralph, for that genuine response. 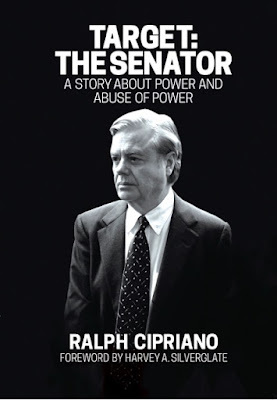 Truth be told, I'm still anxiously waiting for my autographed copy of The Senator. I hope sales have been brisk. You have made it clear that your reading of the Indictment is not convincing enough to you that the serious crimes that were charged and not charged are in question. We shall see. I would surmise from your arguments that Doc has granted you the rights to write his Biography which will sit on the mantle of every alcohol blooded Mummer IBEW Member on 2 Street. He might not have swindled the funds that Vince was able to parlay during his checkered and corrupt career, and retire to his Art Museum Mansion far from his humble childhood home that his immigrant banking family raised him, but my guess is that there will be enough money to fund his sordid Legal Team managed by his criminal Supreme Court Justice Brother. It certainly will be a Fancy Brigade. Johnny Doc is the living Whitey Bulger of our time, and probably has his PR Team shaking down Comcast to produce it. You're not seeing this clearly. I didn't say that the crimes as charged in the Johnny Doc indictment weren't serious. They certainly are, and if true, certainly show how corrupt Philadelphia is. The evidence alluded to in the indictment also seems compelling, the result of wiretaps and FBI accountants going through union books and bank records. But since some official in this town goes down on a corruption indictment every few years, I don't see the Johnny Doc indictment as earth-shattering as you and Larry do. In terms of our corrupt and contented city, there's nothing new under the sun here. I barely know Johnny Doc but appreciate him as a colorful character. I have no plans to write the Johnny Doc story. I also think your comparisons to Whitey Bulger are overblown, as nobody has accused Doc of murder that I'm aware of. Regarding Vince, your take seems to be drawn from years of reading the Inky. Again, my book not only has Vince's first-person account of who he is and what he did. 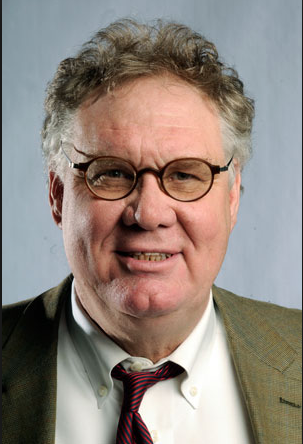 I'm also the only reporter that I know of who snorkeled through 500 pages of formerly classified FBI files on Vince dating back to the 1970s. As well as all 17 volumes of discovery on Vince, featuring grand jury transcripts and FBI 302s, that were turned over by the government before trial. Vince is a complicated guy and so is his story. It's not the cartoon version that you've been fed by the likes of Craig McCoy all these years. Ralph, I appreciate the energy and intelligence that you continue to bring to the discussion. It has been my contention that the attempt by the Inquirer to silence you, and other great heroes of Journalism who have been marginalized is what has brought this Country to its low state and need for vigilant reform. When gangsters reach high levels of power, they have been able to corrupt the Institutions created to keep them in check. You have made a career out of exposing the nefarious and malicious activities of those who have held high office in the Church and State, and the public should be forever grateful for your tireless efforts and recognize your achievements. That doesn't allow us to excuse the characters who have not been charged for public corruption in cases like Senator Fumo, who performed great work and deeds for his constituents and contributors but political cretins like Edward G. Rendell Esq. who was first elected to Office as a reformer and theoretically sought to remove the stench and corruption in power by mafia owned D.A. Emmett Fitzpatrick, then became the crime boss he was elected to root out. The media loved Fitz and at the same time Mayor Frank Rizzo. They were heroes who were lionized by the Media because they were installed by the corrupt powers that owned the apparatus such as the now worshipped Walter Annenberg. They had powerful journalists and image makers assigned to lionize them and groom their image. We move on to today, where Comcast, is the greater power and influence in local and national affairs than could not be imagined when Annenberg ruled all levels of media and was the King Maker of unequaled countenance. When Johnny Doc was shaking down Comcast, they were a willing partner, otherwise his downfall would have been a forgone conclusion. Just as when Senator Fumo with Governor Rendell unilaterally forged the Legislation and Law for Casino Gambling without bringing a referendum before the voters on the issue and allowed crooked politicians to reward their cronies and partners. This Indictment is a sham because Dougherty should have been charged under RICO and Comcast should be included as a Co-Conspirator. Much as Vince, when shaking down PECO and padding his Non-Profit and using it as his piggybank and partnered and was rewarded by criminal powers for decades for his tireless efforts for self benefit was not fairly charged and allowed PECO Executives complicit in the extortion to skate free while watching Vince's low level loyal employees to suffer. The RICO Statute should have been applied for politicians as well as organized crime figures because the successful criminal is usually an Ivy League Attorney or someone like David Cohen, Comcast VP and Trustee Chairman of U. of P., who continues to use Rendell as his fixer in place, ready and willing to manage and reap great reward for a career unmatched as a criminal unchecked. If the Feds were willing to right the wrongs of a corrupt Union Boss who has been chronicled for years for a litany of crimes, they should bring down Politicians Judges and Corporate Executives who have given him the power and influence he has misused. You've read too many of Craig McCoy's comic books. For what really happened with PECO and Verizon, you need to read my book, because I did more reporting that Craig did. And had more of the government's own documents to work with. In their private meetings with FBI agents, the honchos at PECO were pretty brazen about what really happened with Vince. They bragged about having the whole legislature bought off except for Vince. And he had figured out a legal way to jam them up, thanks to the brilliant work of his top lawyer. For a guy who thinks he knows a lot you really need to read my book, as I've done more reporting than you've done. In the interest of transparency, which the Inky demands from politicians, we should make mandatory the political party designation after a reporters name, much like politicians do to denote their party affiliation, such as James Kenny (D) Philadelphia. Readers take with a grain of salt an article where a Democrat bashes their Republican colleagues or a Republican thrashes a Democrat, an article that would read Chris McCoy (R) Philadelphia trashing a Democrat might look a bit different to a reader. Defense attorneys when defending a politician might make note of the fact that their client was continually disparaged by reproters of an opposing party to influence the outcome of a trial. A great idea that the media would never go for, but voters registration records are public the last time I checked. Many of the politicians I've covered used to check up on my ID. That's why I've been listed for the past 40 years as an independent. Most Inky reporters would carry this designation -- CCLD -- as in card-carrying liberal Democrat.